Advancements in wearable technology have facilitated performance monitoring in a number of sports. Figure skating may also benefit from this technology, but the inherent movements present some unique challenges. 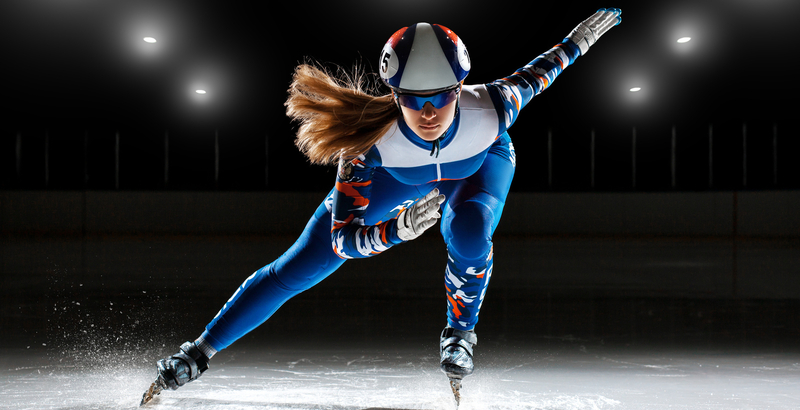 The purpose of this study was to evaluate the feasibility of using an inertial measurement unit (IMU) to monitor three aspects of figure skating jumping performance: jump count, jump height, and rotation speed. Seven competitive figure skaters, outfitted with a waist-mounted IMU, performed a total of 59 isolated multi-revolution jumps and their competition routines, which consisted of 41 multi-revolution jumps along with spins, footwork, and other skills. The isolated jumps were used to develop a jump identification algorithm, which was tested on the competition routines. Four algorithms to estimate jump height from flight time were then evaluated using calibrated video as a gold standard. The identification algorithm counted 39 of the 41 program jumps correctly, with one false positive. Flight time and jump height errors under 7% and 15% respectively were found using a peak-to-peak scaling algorithm. Rotation speeds up to 1,500°/s were noted, with peak speeds occurring just over halfway between takeoff and landing. Overall, jump monitoring via IMUs may be an effective aid for figure skaters training multi-revolution jumps. The research details the wearable jump monitor and its success in tracking jumps through a series of trials with seven competitive figure skaters. The results show the device accurately tracked more than 95% of the jumps. The main motivation behind the device is to help skaters train smarter and more efficient. Skaters and coaches have been very interested in the device. Of course, so has U.S. Figure Skating, which is helping sponsor the project.